The Marie-Curie project “Glass, Faience and Food in Late Bronze Age Societies: An Analysis of the Socio-Economics of Urban Industries in Egyptian and Mesopotamian settlements” (EU Project #653188) aimed to establish an in-depth understanding of the administration and control of high-temperature industries on an urban level and the socio-economic relationship between the elite and the non-elite members of society in Late Bronze Age (LBA) Egypt and Mesopotamia (c. 1650-1050 BC). It has been recognised in the past that within the urban settlements of Egypt and Mesopotamia the production of basic faience- and glass-objects frequently occurred in the same urban domestic context as that of foodstuffs, using the same tools and firing structures. 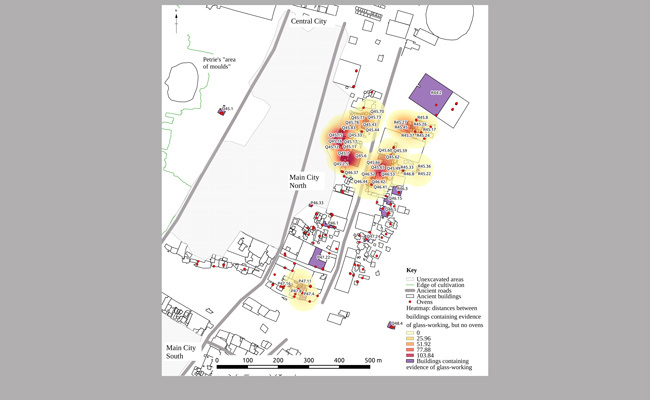 The project investigated how elite control influenced these domestic industries in an urban setting, and to what extent this influenced the role of the members of a non-elite population and the urban infrastructure, concentrating on the New Kingdom Egyptian settlement of Amarna, but also including other Late Bronze Age Egyptian and Mesopotamian sites. 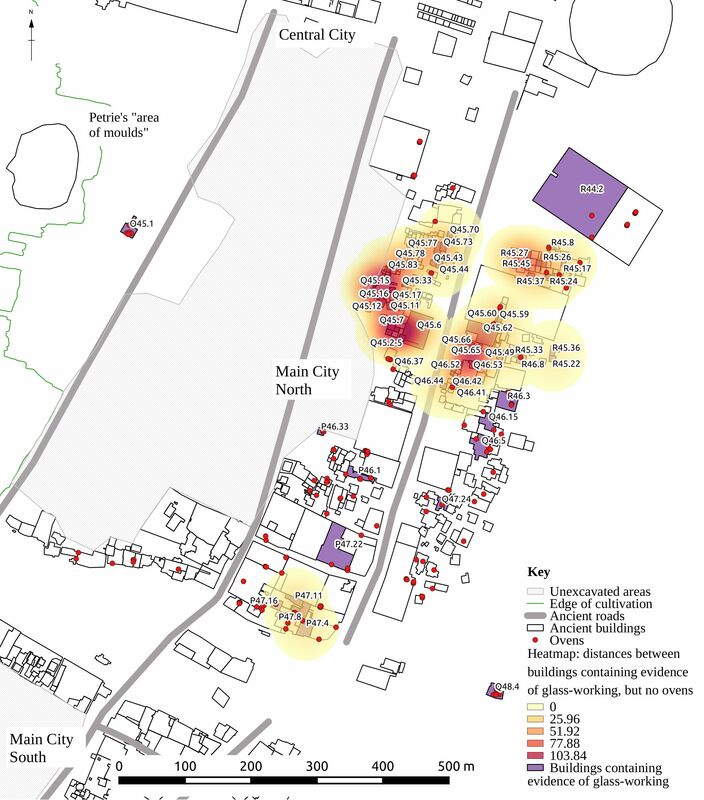 The main tools in this project were Geographical Information Systems (GIS), which enable a detailed spatial analysis of the relationship between the production of glass artefacts and that of faience goods and foodstuffs as well as the organisation of workshops and areas of industrial activity throughout the urban sites and their infrastructures. Domestic and administrative archaeological contexts containing a combination of glass-working, faience manufacture and food production have been identified, documented and analysed in detail. The research has already provided much knowledge insight into urban workshops and domestic industrial settings, in particular with regards to Egyptian settlements. It appears that household production of luxury items was far more common than previously assumed. Furthermore, a large amount of evidence exists for integrated crafts, the sharing of raw materials, including colourants used in vitreous materials production such as cobalt and copper and the multifunctionality of kilns and ovens. 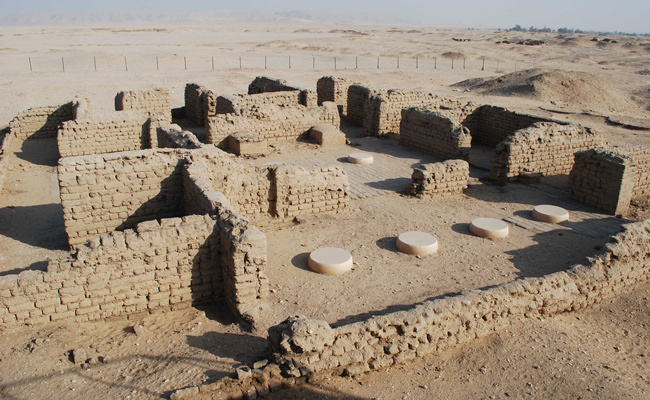 Pending work includes a comparison of industrial activities within ancient Egyptian settlements and contemporary ancient Mesopotamian settlement and palace sites and an analysis of export and trade networks, which demonstrate how the products were consumed, transported and traded. 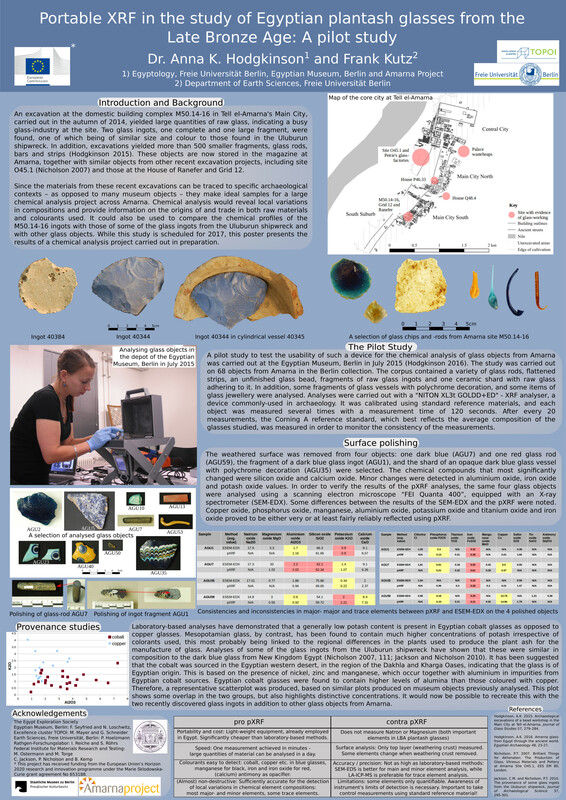 In addition, compositional analysis were used to determine the use and exchange of raw materials (see: www.annahodgkinson.co.uk/images/Poster_Hodgkinson_ISA2016_large.jpg). Anna Hodgkinson, “Amarna glass: from Egypt through the ancient world”, in: Egyptian Archaeology. The Bulletin of the Egypt Exploration Society, 48 (2016), 23–27.